All our arrangement are custom made. 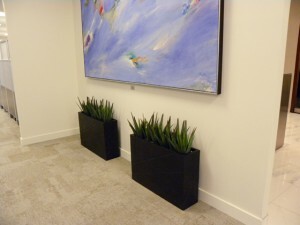 After a consultation with the client, we suggest plants and containers to compliment the decor of the office. Hundreds of containers are available. We use the same planters that we use with our live plants; this can make all the difference in making the plants look more realistic. A suitable planter can help achieve more size and impact too. 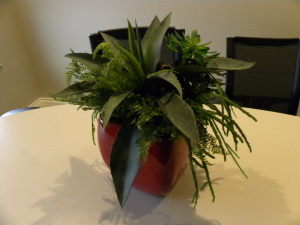 Artificial plants for the office have many benefits. They can be used in areas too dark for real plants. They can be designed so they fit into small or unusual places. 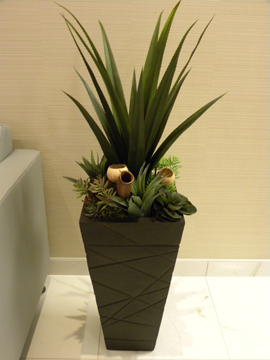 We have often created plants for specific purposes such as room dividers, ways to direct traffic flow, or as a way to dampen sound in large empty spaces. 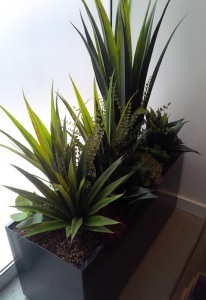 They are easy to care for and eliminate the cost associated with the maintenance of live plants. Artificial Agave Plants in a downtown Toronto office.